"The Audi Q3 is not only the most awarded luxury SUV in its segment but also the most successful. We are the market leaders in the luxury SUV segment and the Audi Q3 further consolidated that position for us.Our customer feedback revealed a growing inclination of our younger customers towards a more engaging drive. The Audi Q3 S Edition is our answer to this ever increasing demand for luxury mobility with the thrill of self-controlled driving. We are confident that the Audi Q3 S Edition, will be yet another successful addition to our success story in India," said Michael Perschke, Head, Audi India. The Audi Q3 S Edition features the 2.0 TDI four-cylinder engine that combines direct injection with turbo charging and offers the right balance between power and efficiency, delivering fuel efficiency of 17.32 kmpl. Audi combines this engine with a front-wheel drive, which works with a hydraulic multi-plate clutch. The six-speed manual transmission in the Audi Q3 S Edition provides the driver full control of the vehicle dynamics, enabling to enjoy a very engaging and exhilarating drive. Adding yet another first to its list of sales and marketing innovations, Audi India launched the Audi Q3 S Edition online, with the launch of the Audi online booking engine, India's first booking engine for a luxury car brand. As a special initiative Audi will offer the first 10 online buyers a sporty off-road style package. "The Audi Q3 market introduction in June last year featured several firsts. We expanded our marketing horizons and ventured into new areas with the Audi Q3 music video, strong brand channels, booking parties at our showrooms, driving experiences and now the online booking engine. These initiatives helped us create a strong connect with our brand enthusiasts. We completed the first round of 500 bookings for the Audi Q3 within just five days of its market launch. Never before had any luxury SUV received such an overwhelming response. I am confident that our innovative approach with the online booking engine will help us garner an equally overwhelming response from our customers and that the Audi Q3 S Edition will further strengthen our Q portfolio and continue to delight the Audi enthusiast," he added. Sporty, efficient and versatile, the Audi Q3 S Edition is equally comfortable on or off the road.The coupe-like lines are an expression of its sporty character. The Audi Q3 S Edition is meant for a customer who has an active and modern lifestyle.E very aspect of the Audi Q3 S Edition showcases Audi technology - the body, the new drivetrain, the chassis, the assistance and multimedia systemsand the high rev manual transmission. The Audi Q3 S Edition weighs 1,520 kilograms. Its rigid, safe and quiet occupant cell integrates a number of ultra-high-strength steels.Both the engine hood and the tailgate are made of aluminum. As is typical of the Q models from Audi, the undivided tail lights are integrated into the tailgate, which wraps around the pillars. The wrap-around, a large arc extending from one front door to the other, is a design feature borrowed from the large Audi model series.The compact SUV is 4.39-m long, 1.83-m wide and 1.60-m high. The Audi Q3 S Edition offers ample room for all five passengers and sets new standards for ergonomics and workmanship. The luggage compartment of the compact SUV has a capacity of 460 liters, which can be increased to 1,365 liters by folding down the split rear seat backs. A roof rail is standard. The Audi Q3 S Edition was launched at the inauguration of Audi Delhi Central, Audi's third showroom in New Delhi and the first-of-its-kind Audi showroom based on the Central Business District concept. 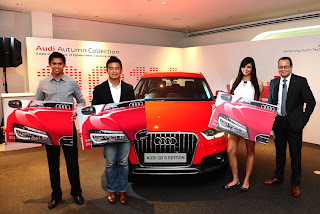 The occasion also marked the launch of Audi Club India, the first dedicated club for Audi owners in India. Audi India inducted 3 honorary members into the Audi Club - India's leading lady Golfer Sharmila Nicollet, Former Captain of the Indian Football Team - Baichung Bhutia and Audi race talent Aditya Patel.